Over the last few months I have been working really hard to develop a brand new skincare routine, that saw me chuck out every single skincare product I owned out and part with some serious cash to develop a new one. It has been hit and miss at times with some products, but I can confidently say that it's had a dramatic impact on my skin. However, now that we are getting into the colder months I know that my skin will struggle when battling the elements and become red, sore and sensitive. So now seems the perfect time to try a range that is soothing and calming for the skin. The Body Shop produces so many ranges of skincare, but I absolutely adore Aloe Vera. It's fantastic for sensitive skin and is best known for its healing, soothing and nourishing qualities. I already used their soothing day cream and their soothing night cream so I decided get more products from the range and use them in my new routine. First thing in the morning, always cleanse your skin with water, then a foam based cleanser. Water removes the few impurities that settle on the face during the night, and keeps skin hydrated, too. Foam cleansers are just that: cleansers that have some sort of foaming, sudsy quality to them. They’re usually suggested for oily and acne-prone skin types since they are meant to deep clean the skin by getting rid of excess oil and sebum, as well as work to uproot any debris stuck in your pores, helping to keep your skin clean and refreshed. My favourite one is this Aloe Calming Foaming Facial Wash from the Body Shop. This gentle cleanser will leave your skin feeling clean, fresh and calmed. And it's amazing for those with sensitive skin. I have been using this facial wash every morning for the past few weeks, and I can already feel the benefits. I'm not going to sit here and write that I have a clear complexion that's blemish free, but this foaming cleanser has most definitely made a difference already. I can't say that I am fan of cream cleanser for single cleansing, I am more of a double cleanser anyway. So if I don't use my Caudalie Cleansing Oil to remove my makeup, I will go for a cream cleanser. I will use the cleanser on dry skin to make sure that I get all those impurities and help unclog mu pores. I love this Aloe Calming Cream Cleanser its a comforting rich cream that moisturises and helps to gently cleanse my sensitive skin. The texture of the cream is very thick, and it last ages. I got this bottle a while a go and it's still going strong. Whenever I think my bottle is nearly done I still manage to squeeze out enough for it to last a good few months. Just make sure you shake it up well enough and it will keep coming out. And that is the only dislike I have about this product the packaging. You cannot see how much is left because the bottle is opaque. Toner is not for everyone, now I must admit before adapting a new skin care routine I wasn't entirely sure what the purpose for a toner was and whether it actually helps the skin. So even though a toner is easily the most misunderstood skin care product and way more important than it receives credit for. Toner is the first barrier product you apply – good toner balances your skin’s PH, and is intended to hydrate – not strip your skin. But balance the skin's pH levels, it's important to apply toner; otherwise the skin can become dry and dehydrated. Toner further helps to absorb the next products you apply. 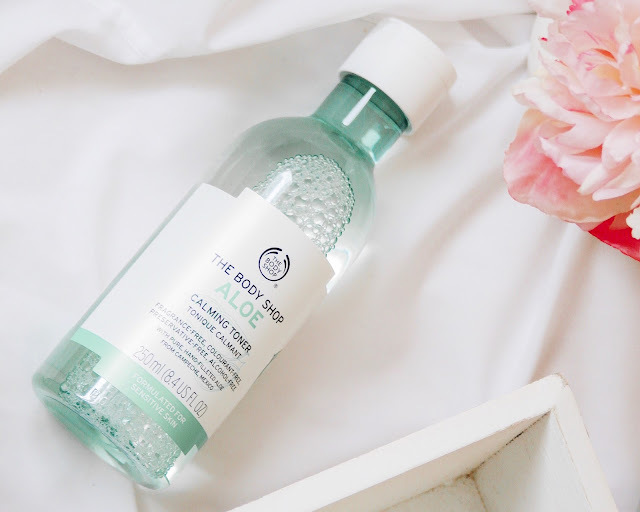 My favourite toner is from the body shop and their Aloe Calming Toner that gently tone, prime and refresh your skin with our soothing toner. Aloe effectively removes residual impurities, to refresh and clarify sensitive skin. A good moisturiser is a must have for me, and a must have for everyone. Whatever you do, never skip on the moisturiser. I tend to kick this up a notch and slather it on my skin during the autumn and winter as this is when my skin needs it the most. It struggles to battle the elements at times. This Aloe Soothing Day Cream is my absolute favourite! I haven't tried anything that can even compare to this little beauty. This moisturiser is cooling to the skin, nice texture, no scent, great for sensitive skin. It is lightweight but very hydrating, providing all the moisture without leaving my skin looking greasy. It leaves my skin feeling soft and hydrating and takes away any feelings of tightness, drying or irritation. A great all rounder! A one that is a must try for those with sensitive skin. A night time moisturiser to keep those skin loving ingredients locked in, allowing you to wake to a beautifully rejuvenated complexion. Now, for my night cream, my gem is the Aloe Soothing Night Cream from The Body Shop. All year round. I use it every night after cleansing as it moisturises and soothes dry or irritated skin, and when I wake up my skin feels cool and soft to the touch. It may seem heavier than most night creams, but it's great for your skin. Just like the moisturiser you use on your face, the one you put on your body needs to be better at locking in moisture too. In a nutshell, this Aloe range is amazing for those who have sensitive skin, whether you have one product or every single product available in the range. It's going to good for your skin. It will help calm and soothe skin especially during the winter months. Have you tried anything from the Aloe range? If so what did you use? Is there another range you'd recommend?